Power tools make tough jobs easier for everyone from professional construction workers to avid do-it-yourselfers. 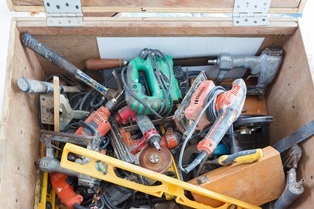 Despite their many benefits, power tools can be extremely dangerous. In fact, they send more than 900,000 people to the emergency room with injuries each year, according to a hazard screening report from the U.S. Consumer Product Safety Commission (CPSC). When power tools malfunction or are handled carelessly, the injuries that occur can be serious, debilitating, disabling, life-threatening, or even fatal. Power tool accidents can deal a significant financial blow to victims, as they often face outrageous medical bills and are usually required to take time off of work to recover from their injuries. Fortunately, the victims of power tool accidents have multiple avenues they can pursue for compensation. If you were injured in a power tool accident caused by a malfunctioning tool or negligent third-party, here's what you need to know. Lacerations: These injuries can be caused by a number of different power tools and can range in severity from minor scratches to deep gashes. Puncture wounds: These wounds can also range from minor to severe, and are often caused by tools such as power drills, nail guns, and electric staplers. Amputations: Fingers—specifically the middle and index fingers—are the most common form of amputation injuries associated with power tool accidents. These injuries are often caused by chain saws, table saws, and circular saws. Electrocutions: Power tool electrocution injuries can be caused by tools with frayed cords, or those that are accidentally immersed in water while plugged in and powered on. Eye injuries: These injuries are particularly common among do-it-yourselfers, due to the wood shavings and other debris that can be generated during home improvement projects. Trip-and-fall accidents: Tripping and falling may not sound like such a big deal, but it can be when power tools are present. These accidents can result in head injuries, broken bones, amputations, or even impalement. Wear goggles to protect the eyes from wood and metal shavings. Never use power tools when fatigued or taking sedating prescription medications. When using a power saw, use a clamp—rather than a hand—to hold the project in place. Never disable the safety or remove the safety guards on power tools; they are there for a reason. If you or a loved one were injured in a power tool accident that wasn't your fault, you may be eligible for compensation—either through workers' compensation insurance or a personal injury lawsuit. The experienced attorneys with the Morris James Personal Injury Group can help you explore all your legal options. Call today to schedule a free initial case review.